LEDs are efficient, but it requires a large quantity of them to equal the intensity of a conventional filament based bulb. Some LED headlights use a number of LEDs, but the problem with this approach is that it is difficult to focus multiple light sources into a single beam. There are 5W LEDs now available but they are very expensive, and have a short life-span. 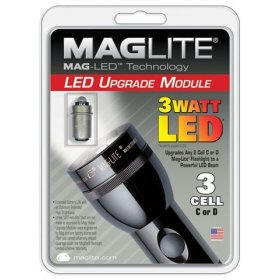 The 3W LEDs are a good compromise, and you could use a 3W LED MagLite with a TwoFish LockBlock, and have an economical LED system. Most of the LED bicycle lights are very poor, though there are some exceptions if you are willing to pay the price. Avoid LED lights with multiple LEDs. You want something with a single, high power LED. You can always add a cheap "being seen" LED light or dynamo powered light for use in areas where bright lighting is not required. The DiNotte 5 watt Luxeon LED Headlight comes with 4AA NiMH batteries and a charger, and costs about $150 (on sale). This is nearly as expensive as the TrailTech HID system. Note that the Luxeon 5 watt LEDs run very hot, and the lifespan of the LED is not nearly as long as normal low power LEDs. LEDs suffer from the same laws of physics as other lamps. Luxeon lights with 3W or 5W LEDs will almost always be made of aluminum or steel, because the casing is part of the heat sink. The CygoLite Hi-FLUX 200 uses a 3 watt Luxeon LED. It uses a water-bottle style battery. It costs $100 (on sale). See http://cygolite.com/ for the entire product line. All-in-one design with integrated NiMH cells (not user-replaceable AA cells). $120 (on sale). See http://bikelights.com for the entire product line. While it would seem that pairing an LED lamp with a dynamo would be a terrific idea, there are issues that have precluded a good solution. First, the dynamo puts out AC, not DC so rectification is necessary. Filtering and voltage regulation is also necessary, as the LED voltage must be kept at a constant level. A buck DC-DC converter is needed to keep the voltage constant which costs some efficiency, though converters can be designed that are over 90% efficient. There is one 2W Luxeon LED headlight for dynamos, the Inoled inolight, but there have been many reports of heat related failures with it (components becoming unsoldered due to the excessive heat generated by the Luxeon LED). 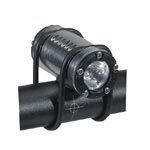 The inolight will work with 6 volt or 12 volt dynamos. It costs $127 from Peter White Cycles. It can also be powered from a battery. Presuming that the reliability issues have been solved, it would make a good dynamo light. See http://www.inoled.com/ for details (in German). The U.S. distributor is Peter White Cycles. See http://www.peterwhitecycles.com/inoled.asp for details. At this juncture, the most economical high-wattage LED option is to buy an AA or C or D Mag-Lite with a 3W LED (the C size models aren't available with the LED but there are 3W Luxeon LED retrofit kits available). Use a TwoFish LockBlock/CyclopBlock to attach it to the handlebars. Avoid the 1W LED flashlights and bicycle lights with the non-adjustable lenses. 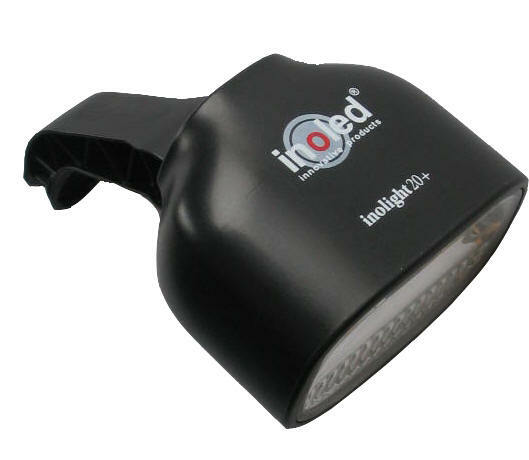 The big advantage of the MagLite versus most other LED flashlights and bicycle lights is that the beam can adjust from spot to flood. Since it's a consumer product, it's not exorbitantly priced. The D cell flashlight is kind of big to have on your handlebars, but it can be used with the Wald flashlight holder. The 2C is a good compromise of duration and size. 3 Watt Luxeon Conversion for 2 C or 2 D cell Maglite. 3 Watt Luxeon Conversion for 3 C or 2 D cell Maglite. Flashlight in a TwoFish Cyclopblock. Don't go more than a 3 C flashlight. About $10. Wald D cell Flashlight Holder (do not use greater than a 2 D flashlight). A more elegant MagLite mount is available from dkg bicycle products. 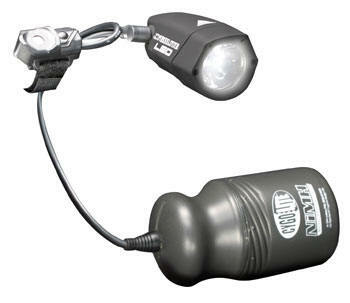 Available for AA and C size flashlights, for 1" handlebars. Shims are available for 7/8" handlebars. $19, $25. and $4 respectively Nite Ize Lite Ride. Holds an AA Maglight. Looks kind of funky to me. Japanese Cycle Commuter using a Maglite type flashlight on her bicycle. She appears to be using a different type of mount, probably a Japanese product. TwoFish products are extremely hard to find. You probably will have to order direct. 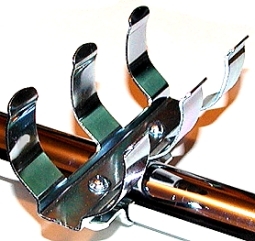 A single, heavy-duty mount is $10 from http://www.boomerdirect.shoppingcartsplus.com/catalog/item/1719053/1226129.htm. 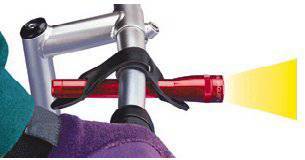 The Wald Flashlight holder is available at http://www.niagaracycle.com/product_info.php?products_id=5780 (chrome). Other colors may be available, according to Amazon. According to the Wald catalog, the part number for the chrome plated holder is 40, for the black the part number is 40GB, and for the white it is 40409. You can't get more retro than this! dkg bicycle products is at http://www.dkg-cnc.com/maglite.html. Lights that use multiple LEDs. The multiple LEDs are not focused into a coherent beam. However the DiNotte light with three Luxeon LEDs is probably fine. Lights that use less than a 3 watt Luxeon LED.